How is the site title constructed? Click “Create person” or “Create organisation” while editing a site or a dataset. Please don’t create the same person over and over again. Use the search field to look for already existing entries. It is constructed using the information stored in the fields “site name” and “country”, which represents the country where the site is located. When entering site information you can upload images. Go to the tab “Name And General Description”. At the bottom of the page you will find the upload form. Select one or multiple images and upload them. New networks or projects can’t be added by users. Please contact us if you want your network/project to be added. Until you “publish” your site it won’t be visible the other users than you. You can publish your content by editing your site and hitting the “publish” button at the bottom of the form. 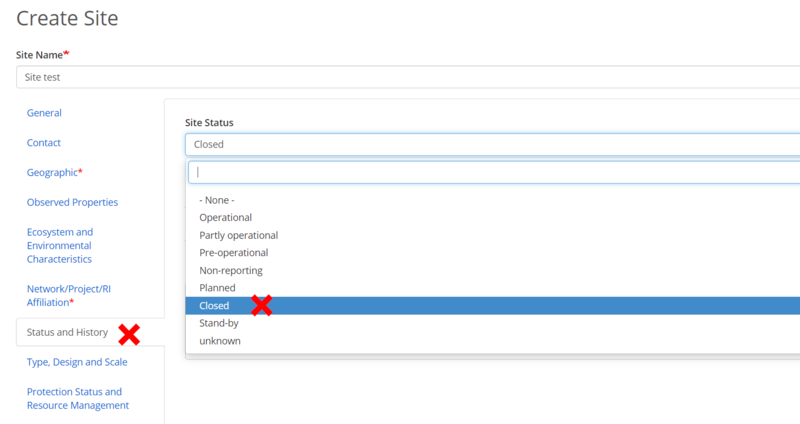 Set the field “site status” to “abandoned/inactive”. A new field will appear where you can indicate when the site closed down. If you encounter any problems or have questions please contact us.